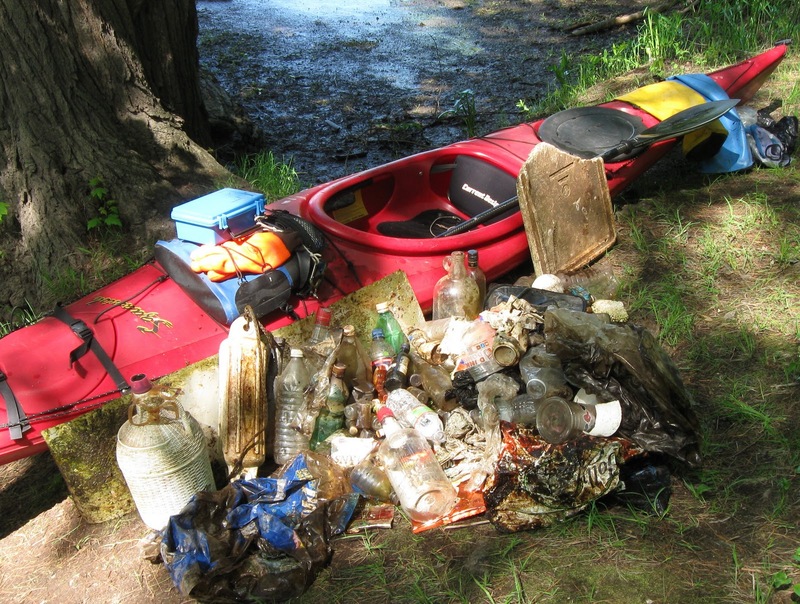 Conditions late this morning were just about perfect for trash paddling the Assabet River in Hudson and Stow. 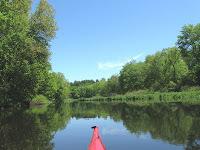 It was my first visit to this stretch of river this year and also my first since the big floods of March. While there was ample trash it wasn't as bad as I had expected. There was, however, a considerable number of plastic bags stuck to tree limbs, stumps, bushes. etc. The usual gang of critters were present: red-winged blackbirds, a blue heron, eastern kingbirds, a few ducks, some small sandpipers, a musquash, and tons of turtles. The obstacles across the river in this area sometimes require portaging. Today, however, I was able to easily paddle around them and would have had clear sailing all the way to Gleasondale, I suspect. The group in the forward hold escaped being in the photo by being very quiet. They were ultimately discovered while loading the boat onto my car's rooftop. The trash count for the day was 139 pieces. The breakdown: 52 recyclable containers (5 redeemable) and 87 pieces of miscellaneous rubbish (27 plastic bags, 21 nip bottles, a boat fender, an elaborate wine jug, and assorted pieces of styrofoam).